Salzburg Global Seminar invites young cultural innovators based in Minnesota, North Dakota, South Dakota, or one of the 23 Native nations that share the same geography, to apply for the 5th annual session of the Young Cultural Innovators Forum, generously supported by the Bush Foundation and the McKnight Foundation. Salzburg Global Seminar is an independent non-profit organzation that challenges current and future leaders to shape a better world. 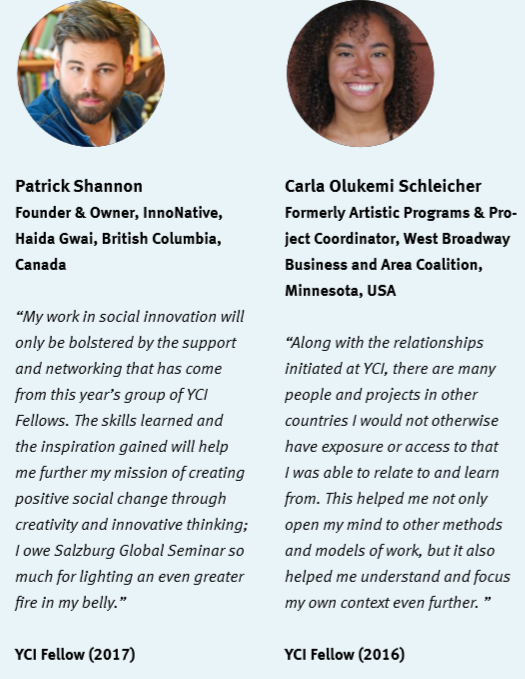 Participants in the YCI Forum will become members of the Salzburg Global Seminar Fellowship network, which since it’s inception in 1947, includes more than 36,000 participants from over 170 countries. Selected participants will receive a full scholarship to participate in the YCI program, including the session fee, room and board, and travel costs. To view or print Open Call as a pdf, click here. The Young Cultural Innovators (YCI) Forum is a ten-year initiative designed to nurture the current generation of young cultural innovators through capacity building, mentoring, and global networking. The network is multi-disciplinary and encompasses creative disciplines ranging from the visual and performing arts, literature, and cultural heritage, to foods, fashion, architecture, and design. Young cultural innovators (YCIs) are highly motivated, creative catalysts with high potential to produce positive community change, particularly in underserved communities. The YCI Forum aims to empower the creative sector as a catalyst of economic, social and urban transformation around the globe by linking individuals and communities connected to the program with one another through programs in Salzburg, follow-up events, inter-hub exchanges, cross-border projects, and other activities. 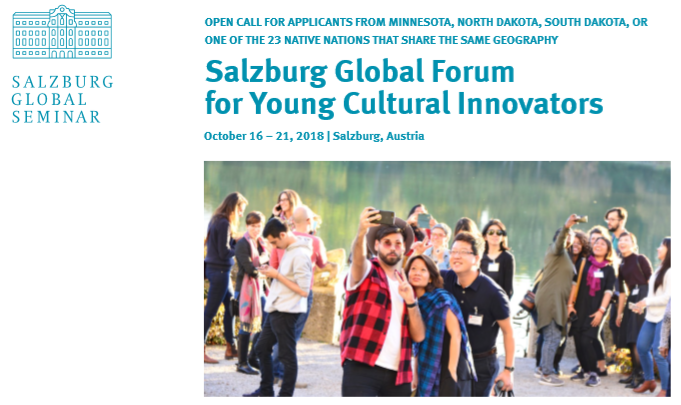 The YCI Forum offers an opportunity for participants to be part of an intensive program taking place at Schloss Leopoldskron in Salzburg, Austria, from October 16 to 21, 2018. Combining theory and practice, with keynote presentations focusing on “big picture” issues facing the cultural sector and with skills-building sessions on communicating value; principles of self-organization; cross-sectoral collaboration; and leadership and values. Selected participants will receive a full scholarship to participate in the YCI program, including the session fee, room and board, and travel costs. With the annual program in Salzburg as its cornerstone, the YCI Forum is structured around a network of YCI Hubs in cities and regions around the world. Each year, YCIs from many of these hubs are selected to join the program in Salzburg. After the Salzburg program, participants continue working together at the local level in their YCI Hub, while also remaining in touch with wider global YCI network worldwide. • Be 25–35 years of age. • English is the working language of the YCI Forum. • Be based in Minnesota, North Dakota, South Dakota, or one of the 23 Native nations that share the same geography. • Have at least 1–3 years of professional experience in the cultural sector, creative industries, and/or at an arts organization or institution. 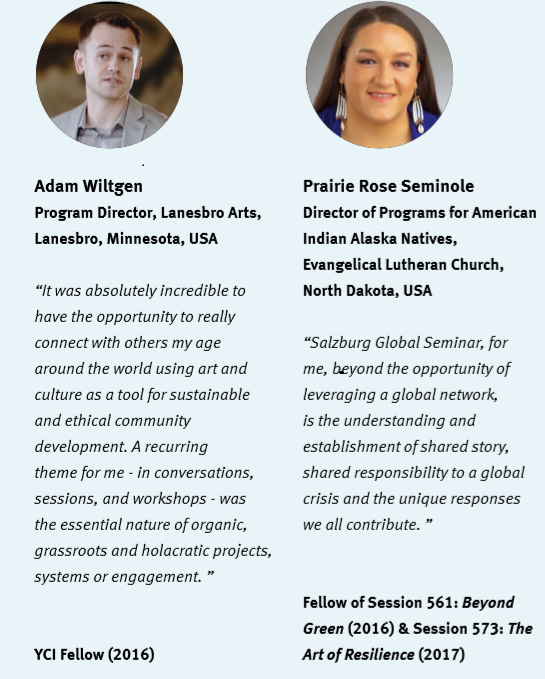 • Want to become an active member of an Upper Midwest US YCI Hub and global network, and be prepared to commit time, energy, and resources to sustaining these. • Aim to create social change and strengthen the position of the arts and cultural institutions within your community. • Demonstrate creativity in approach to work, openness to innovation and risk-taking, action-orientation, and entrepreneurial inclination. • Have a cross-sectoral approach to work and demonstrate an interest in building cross-sectoral alliances/partnerships beyond the cultural sector. • Exhibit passion, enthusiasm, and leadership potential. • How your participation will have an impact on your local community. A photo of yourself (this does not need to be professionally taken). A CV/Resume including name and email address of 2 references. For questions concerning the application please contact Bernadette Prasser (bprasser@salzburgglobal.org). Please include only the information outlined above. All applications should be directed to Salzburg Global Seminar.